As I posted earlier in the year, one of the projects I really wanted to get to this year was making a homemade root cellar. I looked up ideas, advice, and plans, without a lot of success. It doesn't seem that there are too many people root-cellaring on a small scale- or maybe they're just not posting about it? Since my basement is heated and I don't have a traditional "cellar", I decided to try out this root cellar idea and share it with you! Inspiration article from Mother Earth News can be found here. You can choose to use buckets you already have at home, or of course get them from places like Home Depot, Lowes or your local hardware store. If the buckets have been used, rinse them out and dry them before you start your project. 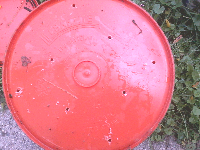 Step 1) Flip the bucket(s) over to drill holes in the bottom. Some of the instructions I saw said to cut off the bottom of the bucket, but since I only have a drill, I just drilled many wholes in the bottom.This helps to veggies inside the bucket to maintain an even temperature, and also for moisture to have a place to leave the bucket. Step 3) Choose your Root Cellar location. Choosing somewhere close to your house is a good idea, because the veggies won't be as affected by temperature changes. The space I chose was also under an bumped-out section of our house, so there's shelter from the elements and strong weather too! Step 4) Dig a hole in your in the special spot you've chosen. Make sure there are no power lines running through the space you're digging! The whole needs to be about 2 feet deep, and a bit wider than your bucket. When you're done digging, you want the top 2-3 inches to but above ground still (see picture). 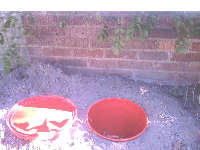 Back-fill the hole so the bucket in snug in the ground- pat down the soil around the bucket. Step 5) Fill the bucket with root veggies of your choice-carrots, potatoes, or onions should all store well in this type of environment. In the case of carrots, you pull off the green tops, leaving only a little stub of green at the top. If you want, you can brush dirt off of your carrots/potatoes/onions, but do not wash! 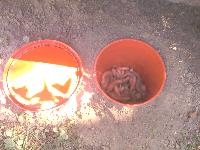 I'm interested in how these buckets worked out for root veggies. 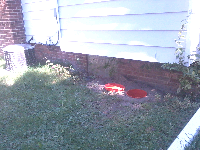 Did they keep well in the 5 gallon buckets? I've been slowly working on improving my root/wine cellar. It was just a small room in the NW corner of the basement == added a dryer vent to the floor for air circulation, insulated a bit, built shelves, etc. I have had great luck with keeping roots particularly. In fact, I ate the last of my cellared fingerling potatoes TODAY: June 1. I've had bad luck storing root veggies in a well insulated basement area. tempature stays at 45 and they go funcky within a few months. I think I'd like to try this method but can't decide where to put buckets so they won't get lost under our mountains of snow. I remembered the polebarn use to have a shower in it that we removed so that area has bare dirt and I think I could get 4 buckets in there. Can't wait to try this! I assume I will need to cover the top with straw or something to keep everything near the top from freezing. This is gonna be hard as I live in an apartment. I would be interested in trying this myself. Can i buy potatoes, carrots and onions from the store and save them this way?